Christina Gonzalez can detect explosives with a single strip of paper. 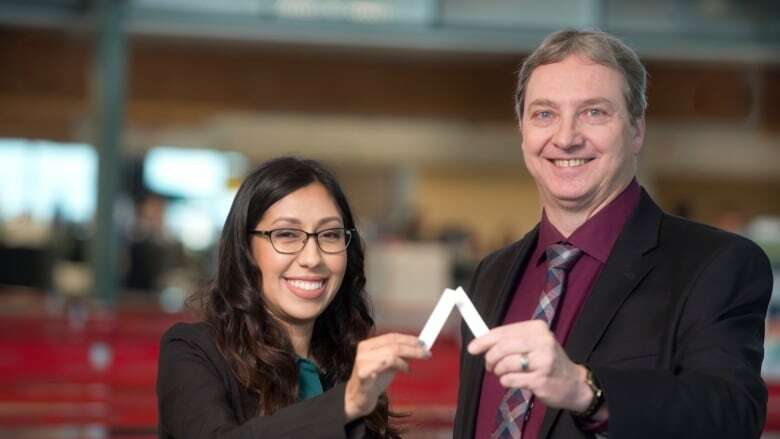 Gonzalez, an Edmonton-based researcher, has developed a disposable test strip capable of instantly detecting explosive materials including traces of TNT. 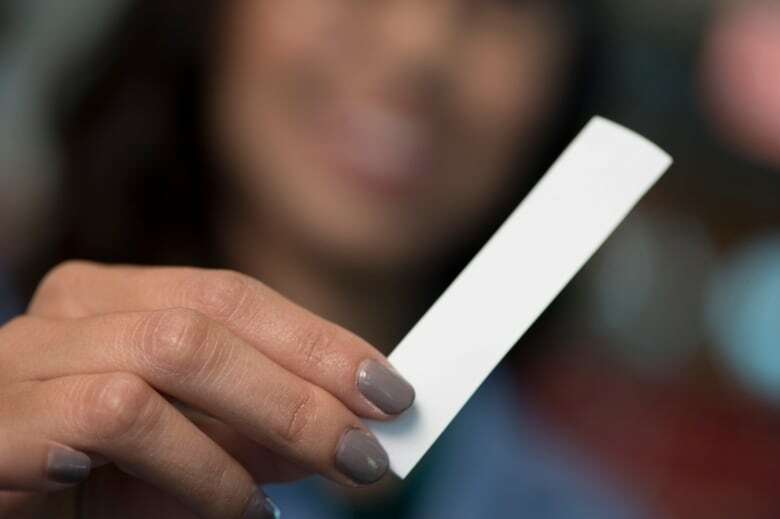 While the paper strip may look like plain card stock there is more than meets the eye. "Essentially, we have a stock piece of paper that we cut to the size we want to use," Gonzalez said in an interview Friday with CBC Radio's Edmonton AM. "After we cut it, we treat it with our quantum dots." Thousands of quantum dots — miniscule semiconductor particles only a few nanometres in size — are embedded into each strip of paper. Under a UV flashlight or lamp, the dots made of silicon glow with a red hue, but are prepared in the lab to fade when trace amounts of explosives are present. "Once you swipe a surface of interest and recheck it under the UV light, if it was exposed to a compound of interest such as TNT, the sensor would no longer glow, you would no longer see that pink glow," Gonzalez said. "It's practically instantaneous. You can swipe and check." The technology was developed by Gonzalez in collaboration with her PhD advisor, professor Jonathan Veinot of the University of Alberta's chemistry department. Gonzalez, a researcher with Mitacs, a not-for-profit organization that connects industry with post-secondary researchers, first explored the idea in her PhD thesis. She began testing it in the lab when she took part in a fellowship with Edmonton-based Applied Quantum Materials (AQM). Then in the fall of 2017, she was approached by AQM CEO David Antoniuk. The company was interested commercializing her technology. Antoniuk said chemical detection strips could not only revolutionize airport security and law enforcement operations, the technology could be adapted to detect food spoilage, illicit drugs or even certain diseases. The technology is not only faster and more convenient than existing methods, it is also much less expensive to implement, he said. "Currently you go to the airport and you are selected or swabbed — we've all been there — and they take that paper and put it into a testing machine. It's a fairly expensive machine, the size of a laser printer," Antoniuk said. "Our technology removes the machine so it's very portable and can be used anywhere like at border crossings or in the field." AQM is now working with the RCMP and other Canadian government departments to explore new applications for chemical detection, including crime scene investigation. The company is also receiving interest from other partners looking to apply the technology in other detection areas, including disease diagnosis, Antoniuk said. The test strips are being tested in various environmental conditions, such as extreme cold and high heat. Gonzalez is also looking to incorporate the testing strips with other materials like glass and textiles. She is excited about the big possibilities for her tiny strips. "If we can use something I'm working on to benefit society, then that's a big driving factor for me," she said.